Stunning vintage Amberina art glass 13 pieces figural punch set. The large reeded handle of the lid for the massive punch bowl creates a wonderful squash like form. The original crystal ladle is intact as are the 10 crystal applied handled punch cups. Each of the cups are original shear top forms as is the base and lid of the punch bowl. No chips, cracks or repairs. 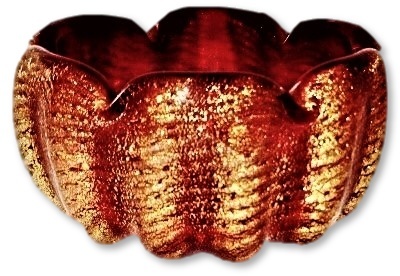 Barovier & Toso, Cordonato d' Oro red and gold adventurine dish or ashtray. Measures 3 1/4" X 1 5/8". 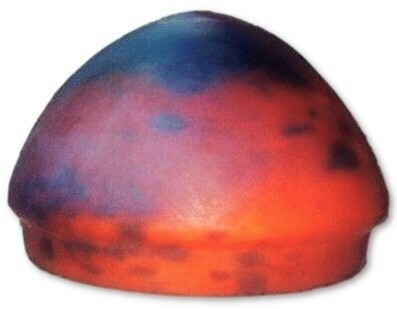 A documented shape, unsigned along with polished bottom. No chips, cracks or repairs. FRENCH CAMEO GLASS & BRASS HOLDER VASE! This magnificent French cameo glass acid cut back vase is decorated with an outer layer of deep satin raspberry glass. The relief A.C.B. decoration of scotch pine needles and pine cones cut back to a white satin interior layer. The brass base has feet that feature scotch thistles, four leaf clovers and fans, all with a rich original patina finish. This vase is held in place by a grouping of four leaf clovers as well that perfectly allow the French cameo cutting to be displayed to its ultimate beauty. This glass is wheel cut inscribed "Invalides Belges Ste Adresse". This was an institution set up at the closing years of World War I in France to benefit the injured and maimed soldiers returning from war. It is most likely this vase was created by Daum Nancy France for benefit of raising funds and awareness for this much needed humanitarian institution. The overall height of this item stands 8 3/4". 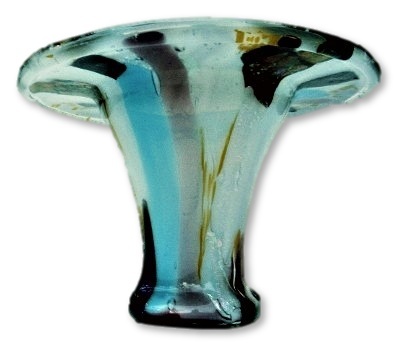 The glass vase alone measures 7" X 2 1/4" while the brass base measures 5 1/4" X 3 1/2" X 3". There are no chips, cracks or repairs and only minimal age use wear to the brass base patina. Wonderful vintage FRENCH CAMEO Acid Cut Back shade. This item may have at one time had a metal frame for it rest in. The rim is an original shear cut which is not fire polished. There is a good deal of detail in the cameo cutting and a fantastic textured background. Possibly by the Schneider Bros. company as they did a good deal of work with wrought iron frames, stands and appetures. Measures 7" X 6 1/2" and the opening at the top measures 3 1/4" across. No chips, cracks or repairs. 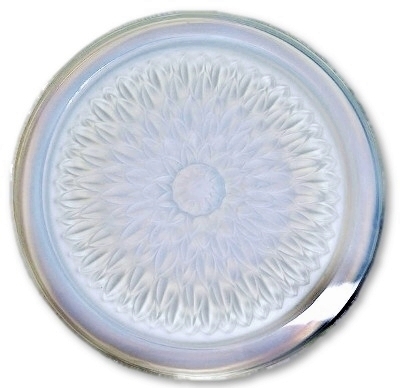 Stunning CHOISEY LE ROI french opalescent dahlia pattern tray. This item has a relief decor in the form of a dahlia. The rim is raised and wheel polished as is the entire back and sides of the item. 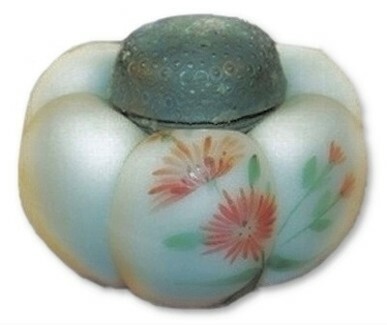 The molded floral design is in a wonderful satin finish. No cross and while the rim is 3/4" wide and 3/4" deep. 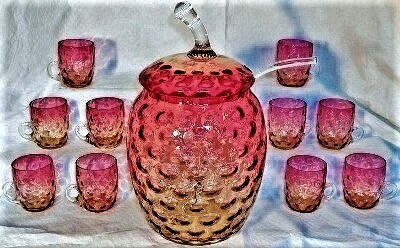 A most fantastic piece of Art Deco Glass with so much fire and opalescent color. No chips, cracks. FANTASTIC CINTRA and CYPRIAN plate. 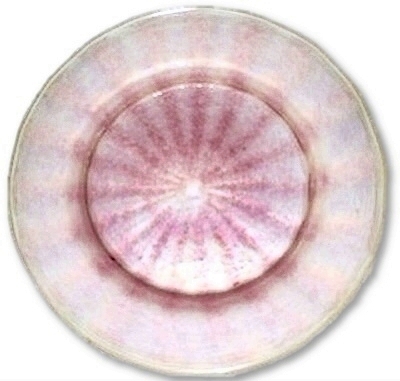 This item has an overall soft Cyprian iridescent finish and a rayed embedded pink Cintra decoration. 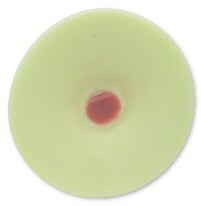 The base has an unfinished snap pontil mark, green edge, pink/frosted white body. Measures 8 1/2" across. There is an extremely tiny flea bite flake on the underside measuring less than 1/16" and an even smaller from the making tiny open bubble on the edge. No other chips, cracks or repairs. Magnificent CRISTALLERIES de BACCARAT french japonisme circa 1880 wheel engraved sea life & facet cut paperweight vase. 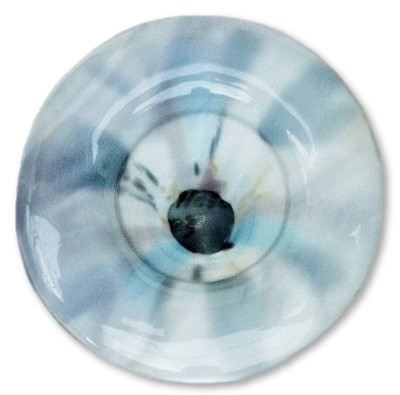 This stunning work of art weighs @ 3lb and stands 9 1/4" tall, measures 3" across at the widest point of the faceted paperweight pedestal foot. The truly life like sea creatures include two long fish a beautiful eel and a flounder swimming harmoniously among sea weed and a coral tree. 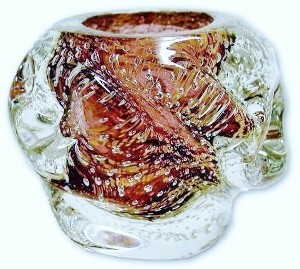 The paperweight pedestal foot is heavily faceted to enhance the heavily cut bottom. We have been unable to find any maker marks. There is some very light clouding to the interior of the vase and some extremely minor use flea bites randomly found on the faceted foot. No other chips, cracks or repairs. Stunning CRISTALLERIES de BACCARAT french japonisme circa 1880 heavy wheel engraved crystal and bronze mounted vase. The mounts are in a Japanese motif and is actually much lighter in shade than our images show. 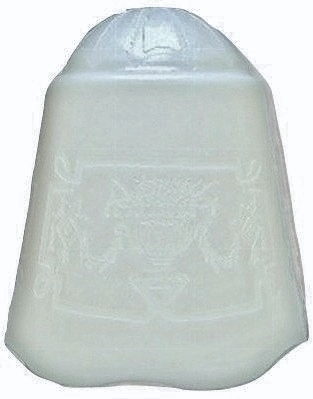 The heavy crystal vase is engraved front and back. It displays 4 beautiful birds in flight above a flowering tree and fence on one side and a fantastic flowering plant on the other. This item appears to have been removed at some point in time from its original mount and glued back in place. There is some damage where the base meets the glass but it is very difficult to see, most likely easily repaired if the new owner wishes. There is some light clouding to the glass as well. This item stands 11 1/4" tall, and 4 1/2" wide X 3 1/2" deep. The vase weighs a little over 3lb. Rare DAUM NANCY pate' de verre miniature lamp shade. 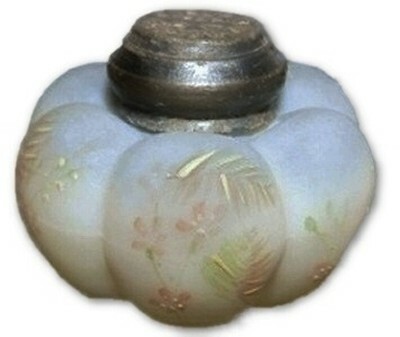 This is a very rarely found form of pate' de verre acid finish mini shade which is normally found on a small art deco miniature wrought iron base. The side of the shade is wheel signed DAUM NANCY. Measures 4 3/4" across at the widest point, 2 3/4" high and 3 1/4" across where the aperture for the base' shade holder is. There is a tiny 1/16" nick to the surface on the exterior of the shade. 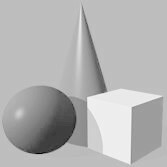 It is shown in the last image to the right side of the shade. No other chips, cracks or repairs. 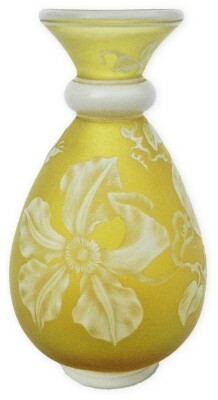 Circa 1925 (attributed) DAUM NANCY FRANCE acid finish massive yellow & orange berluze vase. We are calling this item as attributed due to a very faint partial signature that we believe are the last two letters of the word DAUM, thus reading faintly a stylized UM on the underside rounded section of the vase. 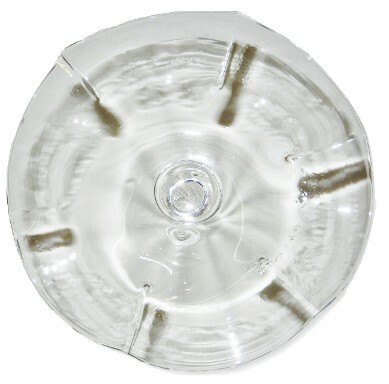 This item does have a 3/8" top rim chip to the exterior which can be ground away. Stands 18" tall and the lower bulbous area measures 5" across. The item is very heavy and sturdy. Other than the noted top outer rim chip, this item has no chips, cracks or repairs. DeVilbiss heavily gold encrusted and wheel cut rose powder box. 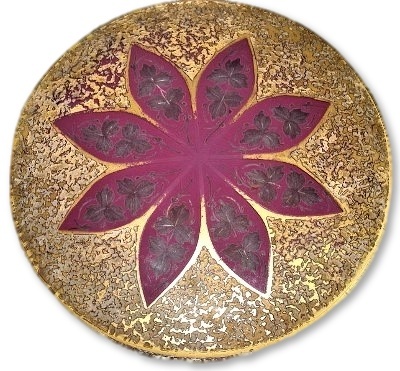 The wonderful gold encrusted acid cut back finish of this rose enameled on crystal glass has windows that show the wonderful wheel cut floral on the lid. 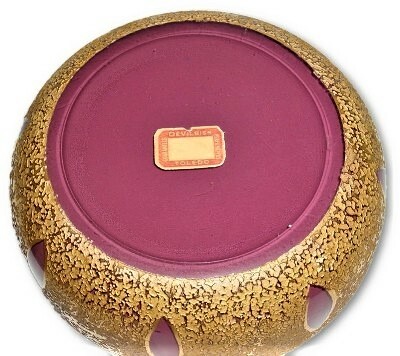 There is some light wear to the gold of the flower on the lid. 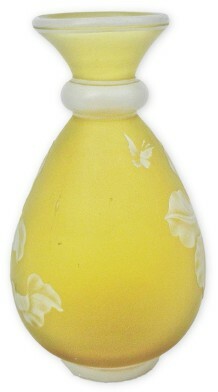 The base retains its paper label which reads "DeVilbiss Toledo Perfumers Guaranteed". The box measures 5 1/2" X 2 1/4". No chips, cracks or repairs. VICTOR DURAND VINELAND GLASS CO. AMBERGRIS yellow and green compotes/sherbets. 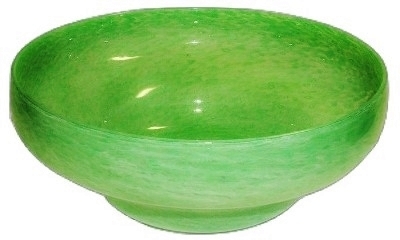 The pair of these low compotes are covered in a soft Iridescent finish over the Spanish yellow and green edge trimmed glass. Each item has a snap pontil up inside the foot/stem. They measure 2 3/4" X 4 1/2". No chips, cracks on this beautiful set. "VICTOR DURAND VINELAND FLINT GLASS CO."
VICTOR DURAND VINELAND FLINT GLASS CO green opaque ribbed lamp shaft. Measure 10" X 3 1/4 across the top and 1" across the factory cut bottom. The interior is finished in an iridescent pumpkin gold while the exterior is in a soft lustered shaded green. The exterior and interior glass layers are cased over flint white making the entire item opaque. At some time a spurious LCT was very lightly scratched into the surface near the base. 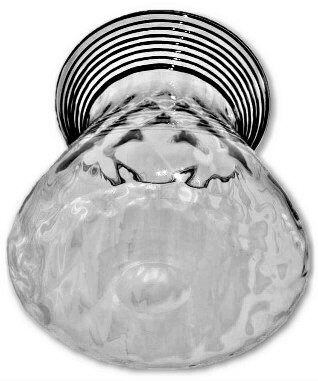 It is very difficult to see and most likely can be polished out due to it not having gone deep into the glass surface. No chips, cracks. MURANO VENETIAN art glass FLORIFORM yellow & white mottled glass finger bowls with attached under plates. We date this pair to the second quarter of the 20th century. 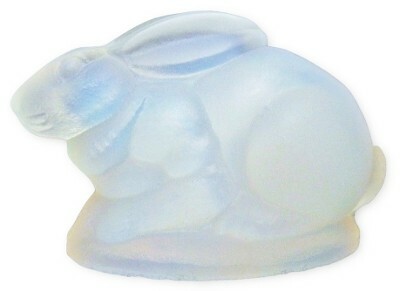 The applied clear glass bun foot is also ground and polished as well as fire polished. The mottled glass of semi opaque yellow and white glass cased within crystal, clear, and then a leaf pattern was pressed on each leaf. Each item measures 6" across and stands 3" high. No chips, cracks or repairs. 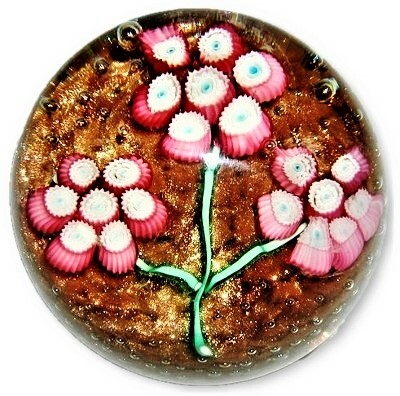 FRATELLI TOSO MURANO ITALY FLOWER MILLEFIORI GLASS PAPERWEIGHT! 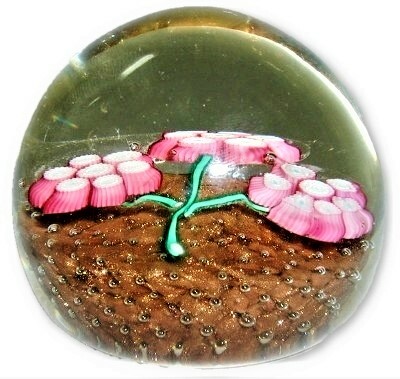 This item is circa 1950-1960's "FRATELLI TOSO" MURANO ITALY paperweights as they were originally marked with paper or foil labels which were very easily removed. Gold/Copper cushion on which the tree of pink, white, and blue canes rest. The stems of the flowers are done in a light green over a dark green layer of glass. The paperweight has only very minor expected base wear and possibly a few extremely tiny marks to the original polished surface. This item measures 3" wide and stands 2 1/2" tall. No chips, cracks or repairs. 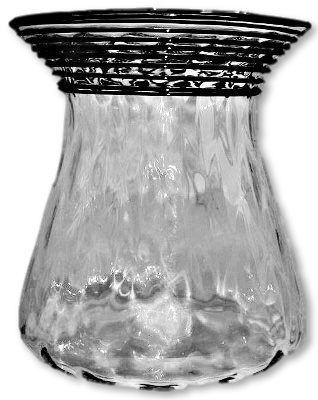 Fry crystal & black threaded optic diamond vase! The black glass threading is in magnificent condition with no loss. The base has a ground and polished pontil. Stands 5 1/2" tall and 4 3/4" across, is unsigned. No chips, cracks or repairs. JONATHAN HARRIS STUDIO GLASS DICHROIC DROP OUT VASE. This item is marked on the bottom in silver with conjoined letters JH 04. The interior bottom of the vase is marked with the artists name along with the date 2003. This item measures 5 1/2" X 3 1/2". No chips, cracks or repairs. HAWKES trefoil acid mark in the ground and polished pontil. 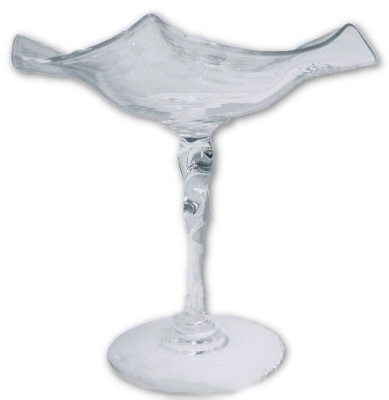 Steuben crystal blank twist stem compote. 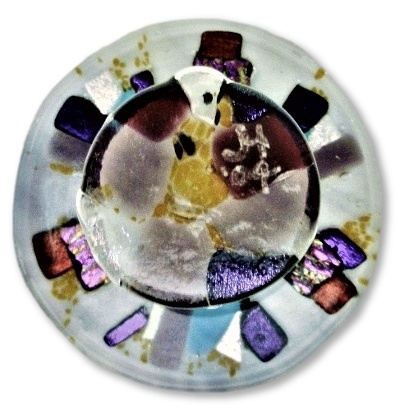 This item was created by the STEUBEN Glass Co. during the Frederick Carder era. This item clearly was meant to be engraved by HAWKES but for some reason it did not get finished. 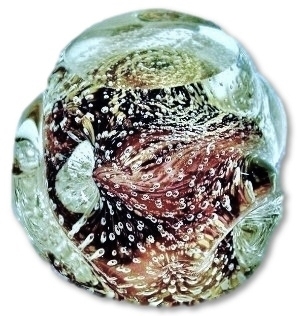 The ruffled bowl of this item has a few inches of raised bubble like anomalies as well as several in the making slumping lines which would have been easily cut out with the pattern and no one would have been the wiser. But again for some reason, it was spared the cutting and now you have the opportunity to own a unique piece of TRUE STEUBEN / HAWKES prior to it's Hawkes cutting. 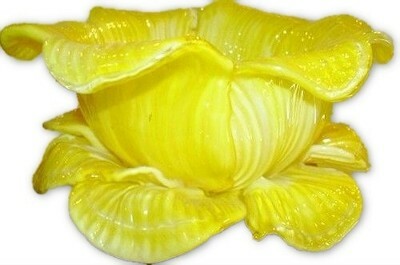 This item stands 6 1/4" tall and the ruffled bowl top measures 6 3/4" across at the widest point. There are some small in the making bubbles and some base wear but no chips, cracks or repairs. 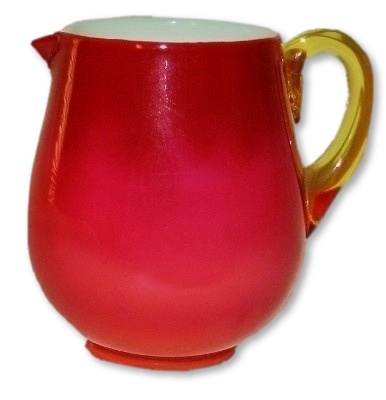 Hobbs, Brockunier and Company of Wheeling, West Virginia 1886-95 Wheeling Peachblow cream pitcher with applied amber handle. Gloss finish, white interior with peachblow shading exterior color. Measures 3 1/4" X 3" X 2". Ground and polished pontil. No chips, cracks or repairs. IMPERIAL brilliant "MIRROR BLUE" vase. This item stands 10" tall. The vase is unsigned. The base has a ground and polished pontil. There is one extremely tiny either flea bite or making tool mark on the very edge of the rim, it is very difficult to see and we photographed the vase with the spot directly center of the top rim. No other damage, chips, cracks or repairs. 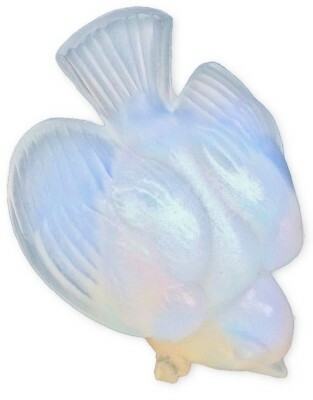 Original marked LALIQUE MADE IN FRANCE "L'AIR du TEMPS" perfume bottle! Retains some of its original perfume (and smells nice as well!). 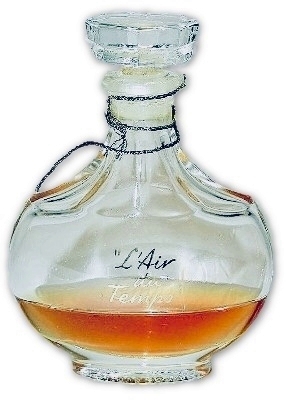 The front of the bottle has its name "L'AIR du TEMPS" intact. 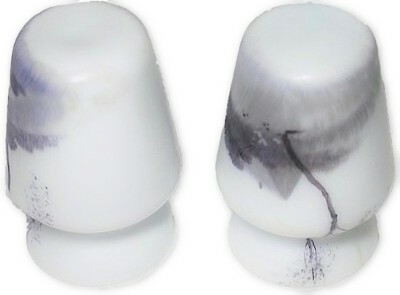 We have not attempted to remove the stopper. 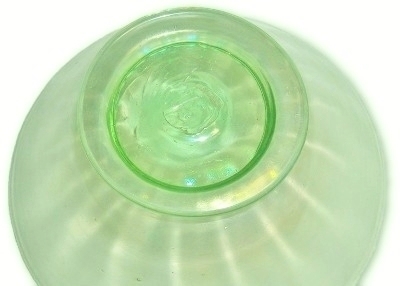 The base is marked in raised letters Lalique Bottle HP 1 OZ 30 cm MADE IN FRANCE. Stands 3 3/8" tall and measures 2 1/2" across at the widest point. The bottle also has its original metal/fabric collar string. No chips, cracks or repairs. *PAIR* of LEGRAS (attributed) ENAMELED OPALESCENT MINIATURE VASES! 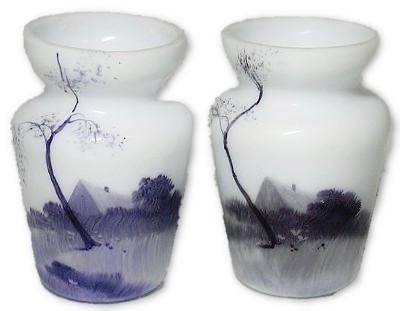 These mini vases rarely turn up for purchase and to find a PAIR is almost unheard of. Though unsigned, they are strongly attributed to Legras and Cie circa 1910. They are painted, one in a little more of a purple color while the mate is in a slightly grayish purple enamel. The design is of a house behind trees and a tall tree in the fore ground. The tops are sheared cut and have as expected a few in the grinding process flakes. Each vase measures 1 3/4" X 1 1/4". Other than the grinding flakes, some inside some outside the very top rims there is no damage or repairs. "LIBBEY CUT GLASS CO. TOLEDO OH." Melon shaped satin glass and hand painted "LIBBEY CUT GLASS * TOLEDO, OH*" This item was produced for the Smith Brothers decorators between 1888-1892. 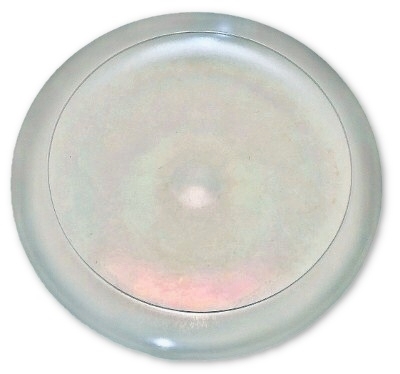 The glass is an opaque opal white while the exterior has a wonderful satin ivory finish. The top rim has a polished shear finish. We are not sure if this item had been made this way or if it had gold enamel which has long since worn off. The condition appears to be excellent. Measures 5 1/4" across and sits 2 1/2" high. No chips, cracks. RARE C.F. 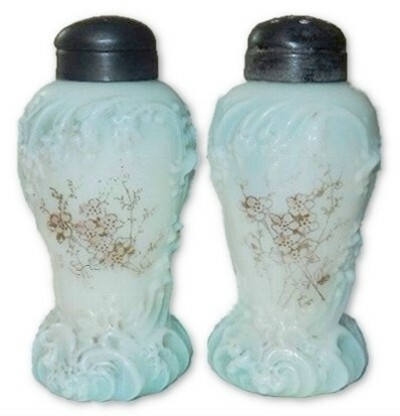 Monroe Co. WAVECREST "Wave Scroll" #383 blue tinted and floral transferred salt and pepper shakers. The matched pair has their original metal tops which are in fair condition with age wear and dings/dents yet are still very usable. Stands 3 7/8" tall and has the remnants of a faint makers mark. No chips, cracks or repairs to the glass and little to nearly no wear to the enamel decoration. Antique Mt. 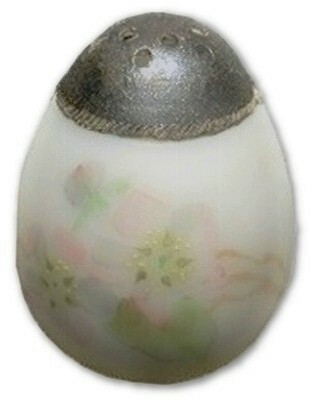 Washington Egg shaped hand painted satin glass shaker. 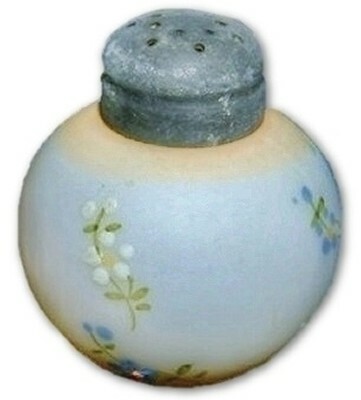 This beautiful shaker is slightly off white with pastel hand painted flowers around the body. The original metal top can be removed and screwed back on easily. Measures 2 1/4" X 2". No damage or repairs other than normal age wear to the metal. Antique Mt. Washington round "LITTLE APPLE" hand painted satin glass shaker. 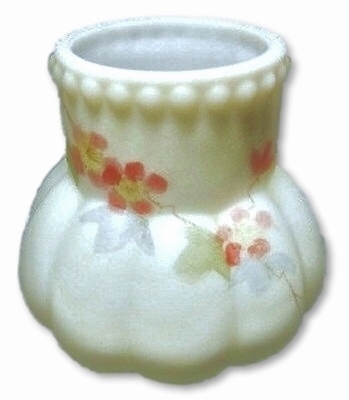 This item has soft apricot at the top and bottom and is a soft white through the center with delicate hand painted pastel flower sprigs. Measures 2" X 2".The top screws on and off without any problem. There are two small circles in the painted ground which appear to be from the artists original production. Normal age wear to the metal and no damage or repairs. Antique Mt. Washington melon ribbed blue shaded hand painted shaker. 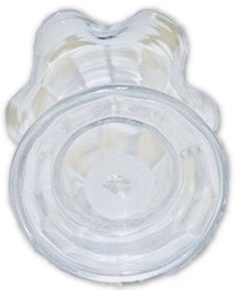 This item retains a small amount of plaster like material which allows the top to stay in place. It can be removed and replaced by the new owner should they desire. Measures 2 1/2" X 2". No apparent damage. Antique Mt. 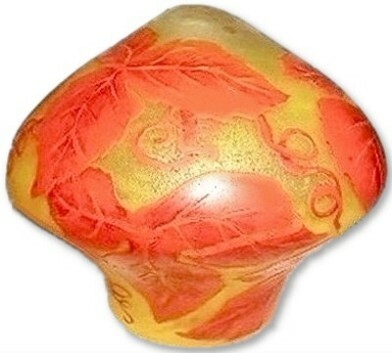 Washington melon ribbed hand painted shaker. . Measures 2 1/2" X 2". No apparent damage. Antique MT. 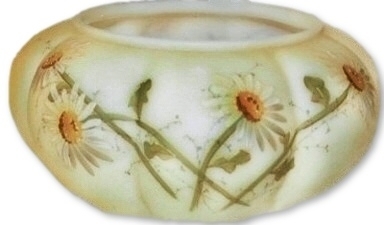 WASHINGTON white satin glass "LITTLE LOBE" hand painted TOOTHPICK HOLDER. Measures 2 1/4" X 2 1/4". This example appears to have a smooth top rim which are normally decorated with small enamel dots. We are not sure if this is how it left the Mt. Washington factory if the dots have been removed. No visible chips or cracks. 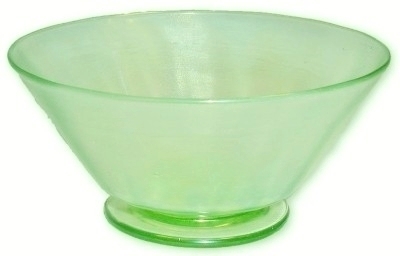 Nazeing Glass of England, pre-WWII CLUTHRA green and white bowl. The base has a 1 1/4" ground and polished pontil mark. Measures 8 1/4" across and 3 1/4" high. Unsigned. There is one very tiny seed inclusion of sand on the outside which is within the glass itself and normal shelf wear to the base. No chips, cracks or repairs. 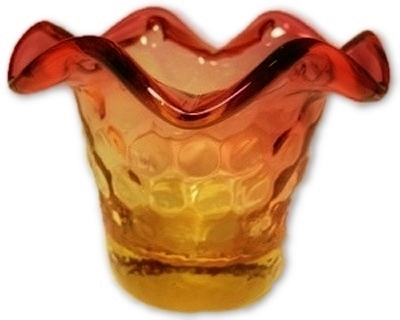 New England Glass Company, AMBERINA inverted baby thumbrint pattern ruffled edge toothpick holder. 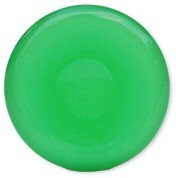 This item has a ground and polished pontil and measures 3 1/4" X 2 1/2" with outstanding color. No chips, cracks or repairs. 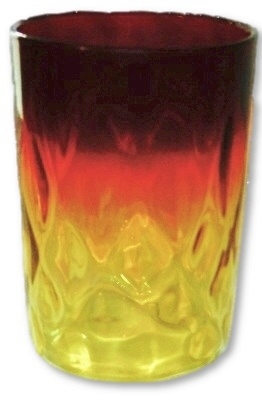 New England Glass Company, AMBERINA inverted diamond optic tumbler. 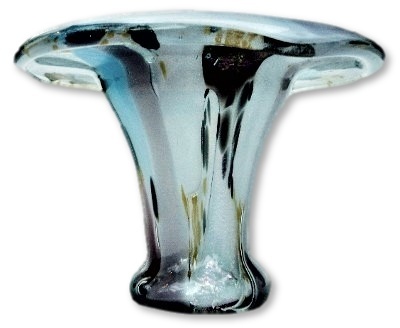 This item has a ground and polished 1 5/8" pontil and measures 3 3/4" X 2 5/8" with outstanding color. No chips, cracks or repairs. 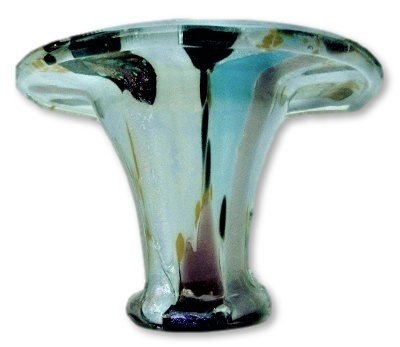 FRENCH PATE' DE VERRE GLASS BERLUZE free form blow and swung vase. BERLUZE form vases were most notably created by DAUM NANCY and by ANDRE' DeLATTE of France during the first quarter of the 20th century. This vase is of deep blue and moderate slate blue with a few splashes of yellowish/green. The top is sheared with some minor interior rim chipping from the cutting process. The base has a leveled ground band. Stands 14" high and the tri cornered dimpled base measures 4 1/2" across at the widest point. We are unable to locate an artist signature. Other than the rim grinding chips, no other chips, cracks or repairs. PHOENIX ART GLASS @ 1883-1887 blue over opal white satin glass air trapped diamond quilt shear top long necked vase. Stands 10 3/4" tall and measures 4 3/4" across at its widest point. This item has a few small dark spots within the layers. No chips, cracks or repairs. Puffy style reverse painted blown out art glass candle lamp shade. This item would have sat into a wood or metal candle lamp base similar to those produced by The Pairpoint Lamp Company of New Bedford Mass. Measures 4 1/2" tall, 5" across at the widest point, the top measures 1 3/4" across and the bottom opening measures 3" across. Unsigned, no chips, cracks or repairs. 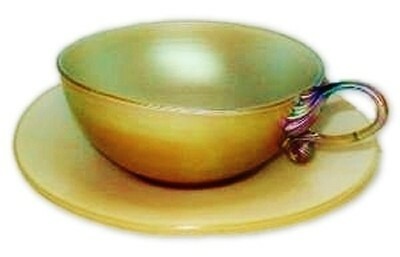 *RARE* cup and saucer by QUEZAL. Signed Quezal. The interior is a mother of pearl color while the exterior a light butterscotch iridescent finish. The cup us lightly engraved and silver marked QUEZAL while the under plate is as normally found, unmarked. The cup measures 5 3/8" across from the outside of the handle to the edge of the opposite rim and sits 2 1/8" high. 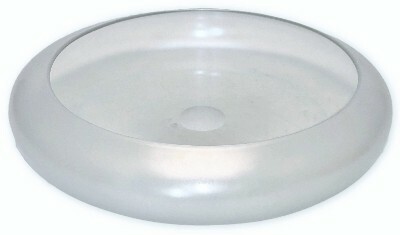 The saucer measures 5 7/8" across and 1" high. There is a very tiny in the making annealing line where the small lower scroll attaches. It is not the tooled line in the handle seen in the image which is a design to keep the finger from slipping. No other damage or repairs. Sabino France Art Deco "Feeding Bird" aka "Oiseau Picotant" figure. Inscribed "Sabino France". Measures 1 3/4" X 1 7/8" X 1 7/8". No chips, cracks or repairs. 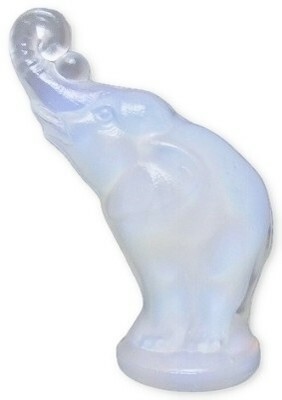 Sabino France Art Deco "Small Elephant" figure. Partial paper/foil label reading "Sabino France" and most likely inscribed Sabino France under the original label. Measures 2 1/8" tall. No chips, cracks or repairs. 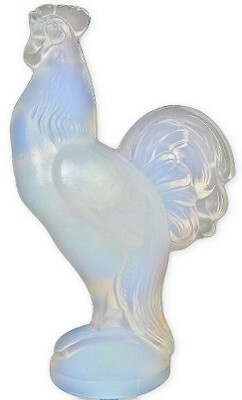 Sabino France Art Deco "Hen" figure. Inscribed "Sabino France". Measures 3 1/2" X 2 1/4". No chips, cracks or repairs. Sabino France Art Deco "Rabbit" figure. Inscribed "Sabino France". Measures 1 3/4" X 1 1/8". No chips, cracks or repairs. 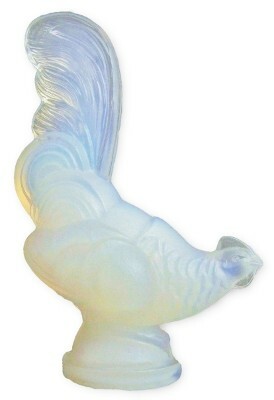 Sabino France Art Deco "Rooster" aka "Chantecler" figure. Inscribed "Sabino France". Measures 3 1/2" X 2 1/4"". No chips, cracks or repairs. 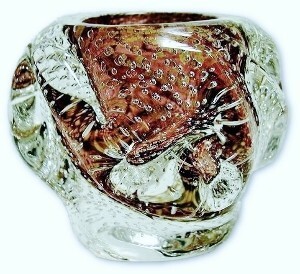 MURANO Italian glass SOMMERSO Archimede Seguso Vetri d'Arte toothpick holder. 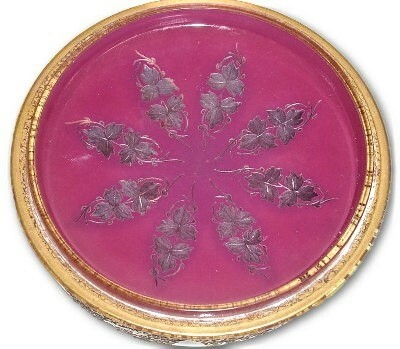 This item is of very thick and heavy crystal glass which also has a reddish/purple interior layer. Much suspended gold flecks and tiny controlled air bubbles throughout. 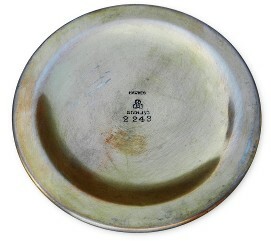 It has a ground and polished bottom and a fire polished top opening rim. Measures 3 1/3" X 3 1/4", No chips, cracks or repairs. 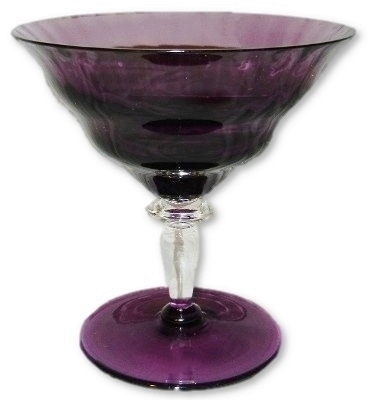 H. P. SINCLAIRE internal ribbed amethyst, purple, and crystal wafer stemmed champagne stemware glass. H. P. Sinclaire Glass of Corning New York 1904-1929 was a direct competitor to Frederick Carder's "Steuben Glass Company". Often confused with the works by Steuben as many of the very same workers worked for both firms. This item measures 4 3/8" tall and 4 1/4" across the top. No chips, cracks or repairs. H. P. SINCLAIRE amethyst purple low stemmed compote. H. P. Sinclaire Glass of Corning New York 1904-1929 was a direct competitor to Frederick Carder's "Steuben Glass Company". Often confused with the works by Steuben as many of the very same workers worked for both firms. This item measures 6 1/2" across and stands 2" high. The base has a 1" ground and polished pontil mark. No chips, cracks or repairs. 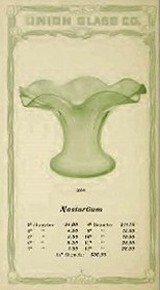 Steuben, Frederick Carder era acid cut back calcite glass lamp shade. Measures 4 1/2" high, 4 1/8" across the wide opening, the original factory drilled hardware opening measures 3/8". STEUBEN shape #2663, unsigned. No chips, cracks or repairs. Steuben green jade spiral rib vase. This is a Frederick Carder era poduct. Measures 8" X 3". A ground and polished pontil, unsigned. No chips, cracks or repairs. 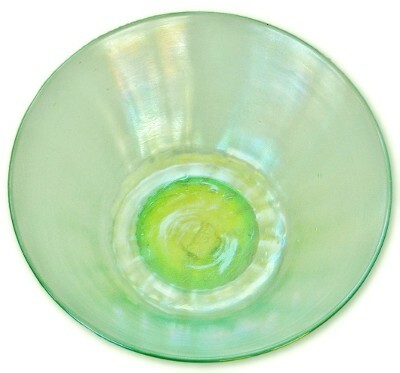 Steuben Verre de Soie (glass of silk) low rolled edge centerpiece bowl. Has a ground and polished pontil and unsigned. Measures 10" X 2". Minor use wear to the underside. No chips, cracks or repairs. 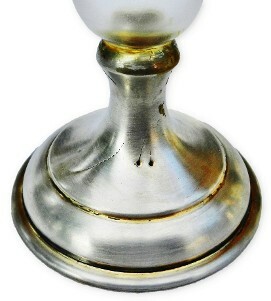 Steuben Verre de Soie wheel cut vase set in its original marked HAWKES Sterling Silver pedestal foot. Marks on the base are "HAWKES STERLING 2243" along with the early trefoil Hawkes hallmark. Measures 10" tall and 3 1/4" across the Sterling Silver base. There are a few dings and a scratch as shown and it appears that some time a long time ago, someone may have glued the two pieces together to insure it not be seperated or damaged. No chips, cracks or other repairs than the two original item having been glued together. STEVENS & WILLIAMS signed English cameo glass cabinet vase. 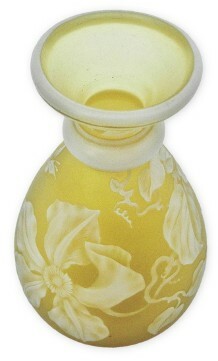 The outer layer of opaque white glass is skillfully hand carved to the acid finished citrine base glass. A large orchid, vines, trails and leaves are joined by a single delicate butterfly. The top rim edge is rounded is unlike the more common cut down versions one normally encounters. Measures 4 5/8" tall and 2 1/2" across at the widest point. The base has a cameo engraved signature "STEVENS & WILLIAMS STOURBRIDGE ART GLASS". No chips, cracks or repairs. MAGNIFICENT LOUIS COMFORT TIFFANY STUDIOS Blue FAVRILE GLASS SCARAB mounted in hand crafted 18kt Gold and 14kt Pin. This is most likely a *ONE OF A KIND* custom DESIGNED AND MADE by Louis Comfort Tiffany at Tiffany Studios New York circa 1910. This same design has been sold in the past as broaches, necklace and a ring. All have brought very high prices and this item is absolutely of the very same hand craftsmanship of REAL L.C.Tiffany Scarab and Gold Jewelry that was produced under Tiffany's direction at the time he became affiliated with his late father's import firm of Tiffany and Company. Louis Comfort Tiffany designed and created some of the finest Art Nouveau and Middle Eastern inspired jewelry of the early 20th century. This example does not appear to have any maker marks and the brass clutch at the end of the pin is the only item that has any markings. It is impressed PATnd13009. It is very possible that this is not the original clutch and the original may well have been the marked piece to this stunning ORIGINAL LOUIS COMFORT TIFFANY STUDIOS BLUE FAVRILE GLASS SCARAB and GOLD PIN! The mounting surrounding the Blue Favrile Glass scarab tests at 18kt Gold and the original attached pin stem tests at 14kt Gold. The Blue Favrile Glass Scarab itself measures 3/8" X 1/4". The overall length of the object is 2 5/8". There appear to be no damage or repairs to this item other than a very tiny in the making mold removal loss to the very edge of the Scarab. This is a common occurrence with the REAL L.C.Tiffany Scarab Jewels and is absolutely from the manufacturing process. 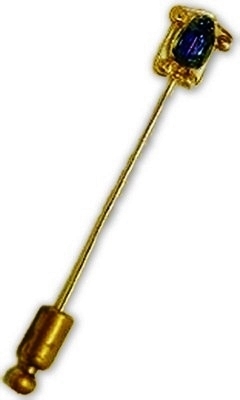 It measures less than the size of a pin head. STUNNING Vintage Louis Comfort Tiffany blue/gold Favrile ruffled salt dish. 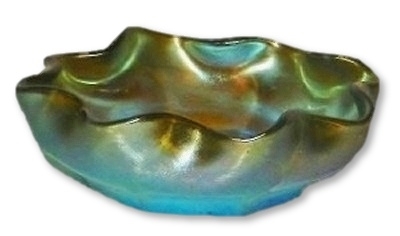 The iridescent finish on this item can not be listed as completely BLUE Favrile or Gold Favrile. 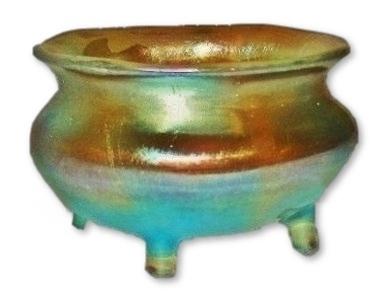 The underlying color appears in areas to be gold with strong blue iridescent finish while more of the item appears to be covered with a true BLUE FAVRILE finish. The underside is inscribed L.C.T. Q8662. Measures 2 7/8" X 7/8". No chips, cracks or repairs. *SCARCE* LOUIS COMFORT TIFFANY Gold FAVRILE long legged witch pot salt dish. The item has a fantastic Gold Favrile iridescent finish and ground and polished pontil mark. The underside is inscribed with a very small but clearly visible L.C.T. Measuring 2 1/4 across and standing 1 5/8" high. No chips, cracks or repairs. LOUIS COMFORT TIFFANY (L.C.T.) 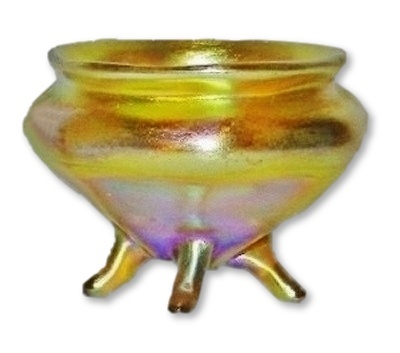 GOLD FAVRILE iridescent 4 leg Witch Pot Salt Dish. This item does have a small sliver chip on a single leg. Measures 2 1/8" X 1 3/8". The underside is inscribed L.C.T. No other chips, cracks or repairs. *STUNNING* LOUIS COMFORT TIFFANY GOLD FAVRILE DIMPLED 4 SIDE TOOTHPICK HOLDER/SHOT GLASS. 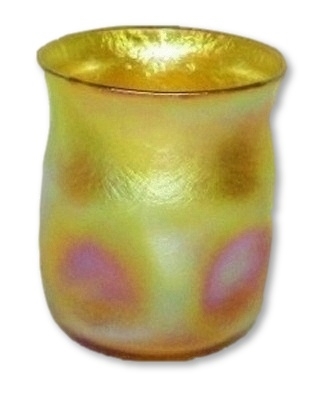 This item has one of the most beautiful GOLD Favrile iridescent finishes we have seen on this form. Some consider this shape a toothpick holder while others will refer to it as a shot glass. This item is inscribed L.C.T. N7806. Measures 2 1/8" tall and 1 7/8" across. No chips, cracks or repairs. 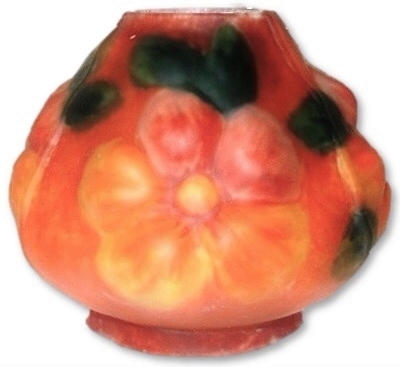 Union Glass Company vase circa 1910. Located in Somerville, Mass. Union Glass produced art and floral inspired glass ware during the first quarter of the 20th. century. 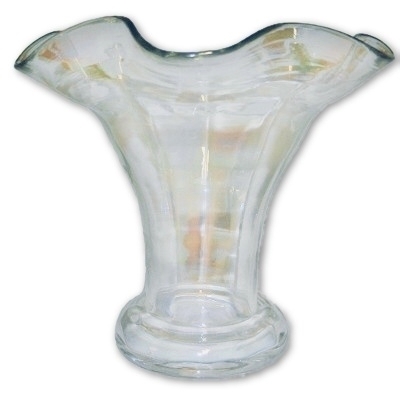 This vase is clear blown glass with a delicate oil on water iridescent finish. The base has a ground and polished pontil. Measures 6" X 5 1/4". No chips, cracks or repairs. VERLYS by HEISEY ALPINE THISTLE bowl. 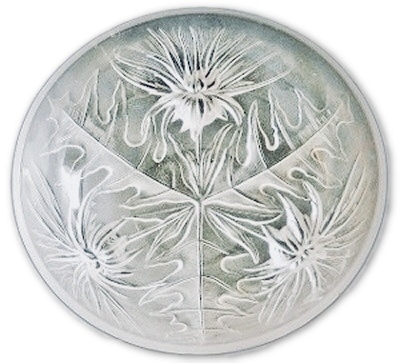 The original mold for this was acquired by HEISEY from Holophane Verlys and was produced in the 1950's.The exterior of the bowl is molded in a high relief technique similar to that employed by Rene Lalique. The exterior is finished with a satin acid finish while the interior is smooth to the touch. Item is unsigned and measures 8 1/2" X 3". No chips, cracks or repairs.